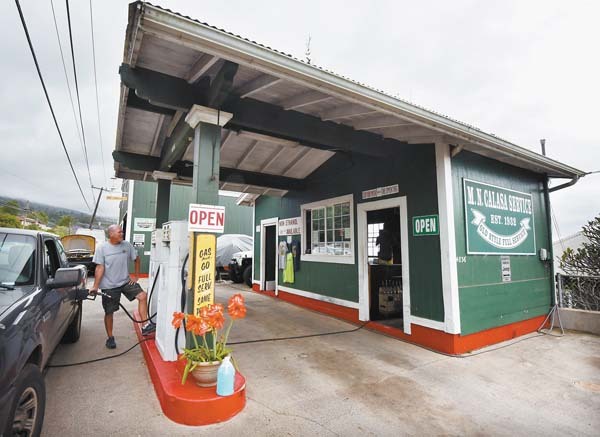 Joe Tomsen fills a customer’s tank at Joe’s Kula Auto at Historic Calasa Garage on Tuesday afternoon. Tomsen said he and wife Andrea sold everything they owned in Wisconsin and moved to Maui after Andrea had a dream that they would live in a green house that had views of the ocean and an observatory. They lease the historic station and nearby garage and house. Tomsen said he just about breaks even selling gas and doing safety inspections, all for the chance to talk to customers. “My gas is cheaper than most stations except Costco and I pump it for them,” he said. His real passion is restoring old Jeeps. “Some people bring home stray cats, I bring home stray Jeeps,” Tomsen said. The station is open 9 a.m. to 5 p.m., Monday to Friday.